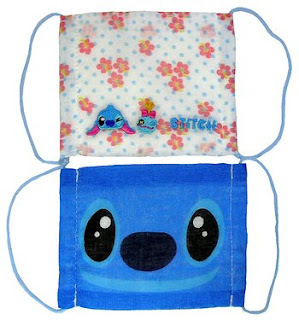 A Rinkya Blog: Disney Stitch Sick Masks! If you read the blog enough, I am sure you may have noticed my love of Stitch, from the Disney movie Lilo and Stitch. Japan also loves the little blue alien and has a variety of items available with Stitch. I laughed today when I saw these gauze masks for sale with my one of my fav Disney characters. In Japan, when one is sick or during flu season, it is common to see them with these masks on to prevent illness spreading. (whether it actually works or not is another story...) However, during a crowded train in Tokyo during rush hour, I am sure it helps. Disney USBS- Stitch on a SurfBoard! We all owe Lilo to our friend and great Disney Animator, Andreas Deja. awesome info about stitch stuff. please join us for fun and adventures at our blog. maybe you can share your stitch stuff with us.